The self-styled ‘Pearl of the South’ is the largest, most celebrated and most popular of Thailand’s resort islands. 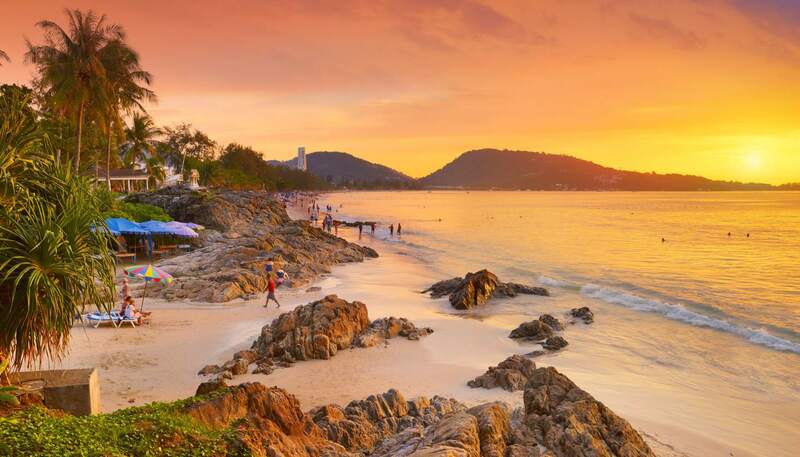 Blessed with tracts of tropical rainforest, a myriad of clean sandy beaches and surrounded by the warm waters of the Andaman Sea, it is easy to see what has made Phuket a top Southeast Asian getaway. Phuket has plenty of great beaches where you can unfurl your towel. The busiest is in the main resort town of Patong. Hat Patong is a fully-equipped beach with sun loungers, sun umbrellas, watersports, beach bars and restaurants. The beaches at Kata and Karon tend to be a little quieter and when the surf is up they are popular with windsurfers and surfers, and even more relaxed beaches are on offer for holidaymakers willing to drive out to more remote spots. The resort towns are pretty much given over to the needs of tourists, while the capital of Phuket Town is more interesting. Over the years Chinese, Portuguese, Malay, Indian and Arab influences have woven into the architecture and culture. The town is home to the most attractive architecture on the island and also to some excellent restaurants where holidaymakers can sample the fiery local cuisine. Phuket these days is very popular with families. The best facilities are within the grounds of the luxury resort, with children’s clubs and crèches both available. The island’s beaches are also great for children. Phuket Fantasea (www.phuket-fantasea.com) is a theme park with rides as well as some colourful cultural and dance performances. Ko Hae is a very popular day trip option and with good reason. This fellow Andaman Sea island, which translates as ‘Coral Island’, is much quieter and less developed than Phuket. There is little to do after the scenic boat ride to the island, bar relax by the sea, or go snorkelling or scuba diving; both are excellent on Ko Hae.